Every mom will truly agree that breastfeeding can be quite starving. Some moms may experience a surge of appetite or may feel hungry most of the time. Having to snack on nutritious foods while breastfeeding is a great help for you and your baby. Breastfeeding snacks not only help you stay full but also help in improving your milk production and milk quality. Breast milk provides the nutrients to your baby from you to supply your baby’s needs. 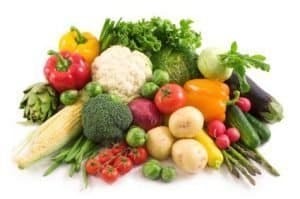 Consequently, your needs for most nutrients must be increased to meet this demand. That is why you need to eat healthy foods and snacks during your breastfeeding journey. Eating healthy will also give you the energy and good health for you to take care of your baby. Being able to munch on healthy breastfeeding snacks will help you keep going throughout the day. At the same time, providing essential nutrition for your precious little ones. What makes a good breastfeeding snack? An effective and good breastfeeding snack should be quick and easy to prepare. We know how mothers rush all the time. So, these recipes should never take too much of your time and energy. To maintain and sustain mommy’s energy, the snacks should be a combination of carbohydrates and protein. These two are ideally combined to avoid unwanted blood sugar spikes. It will also be awesome if your breastfeeding snacks will contain galactagogues. With these galactagogues, you will be able to increase and boost your milk supply even more! 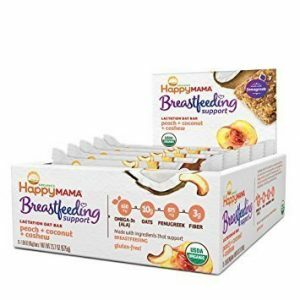 Ideally, breastfeeding moms should be eating organic and unprocessed foods so that babies will also stay healthy and free from artificial ingredients. A good breastfeeding snack should also be low-calorie, especially for moms who are fond of snacking late at night. Being nutrient-dense is a very important thing when it comes to breastfeeding snacks. Mothers should choose nutritious ingredients such as fruits and vegetables and incorporate it to different recipes. An awesome breastfeeding snack should also be exciting and comes in different varieties. Just because you need to healthy, doesn’t mean that you only get to eat boring foods. Don’t be afraid to mix and match your favorite healthy ingredients and come up with a fantastic breastfeeding snack. 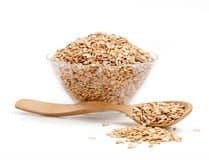 Oats and oatmeal are a good source of iron. They can help moms who have developed maternal anemia to boost their iron levels. Since it is known that anemia can decrease milk supply, oats can help you get away with that. Oatmeal is also a comfort food for many women. Any food that increases relaxation for mothers can encourage let-down as well, and hence improve milk supply. When you’re breastfeeding you tend to produce more energy than the usual. Also, it can be very tiring and draining. So make sure you include starchy carbs in your recipes to keep energy levels at peak. When choosing rice, pasta, or bread, go for wholemeal versions as they are a lot healthier for you. Potatoes are good too! Nothing can beat fresh fruits when it comes to providing nutrition. Bananas are the best on-the-go fruits snacks as they just need peeling and you can eat them straight away. Some of the best fruits to snack on while breastfeeding includes: unripe papaya, avocados, strawberries and other berries, cantaloupe, and apricots. Of course, vegetables should also be present! You can munch on chopped carrots or sliced tomatoes to keep you going. Sliced cucumber and lettuce are great since they have high water content for additional hydration while breastfeeding. You can also treat yourself with malunggay soup to fill you up. These are really important since lactating women need twice as much protein as non-pregnant or non-lactating women. Protein is an important component of breast milk that’s why healthy consumption of protein is helpful in maximizing milk supply. Eating a variety of high-protein foods can help lactating women meet their protein needs. 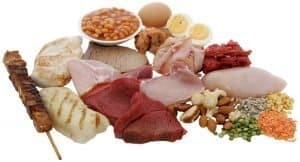 Lean meats, poultry, seafood, eggs, soy and dairy products, nuts and seeds are rich sources of dietary protein. Although some mothers should be extra careful when consuming nuts, eggs, and dairy products since these are also allergens. Hard-boiled eggs are ideal go-to snacks because they are healthy, high in protein and so easy to prepare. 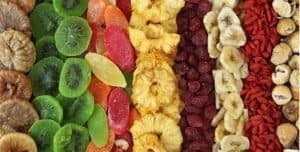 Dried fruits are rich in iron and essential nutrients. That is why they are great snacks to have when breastfeeding. Raisins, prunes, dried papayas are great but you also need to stay away from those dried foods that are made with artificial preservatives. Drinking plenty of fluids and staying hydrated is extremely important when you are breastfeeding. As you are, of course, giving up plenty of fluids each time you feed your little ones. It is ideal that you constantly have a drink prepared for you when you are breastfeeding. Water is the best choice of course. 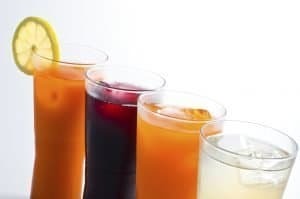 You can also drink milk, unsweetened juices, or lactation teas and drink mixes for added options. If you are eating healthy and generally love healthy foods, then you can enjoy your favorite dishes during breastfeeding. However, there are certain food and drinks that you usually take during normal days but ideally should avoid when breastfeeding. Although there is no evidence that caffeine can reduce milk supply, it can still have an effect on babies. Caffeine can get into breast milk and accumulate in your baby’s system, which may interfere with his sleep and cause irritability. Most breastfeeding mothers can drink caffeine in moderation, 1 -2 cups a day. 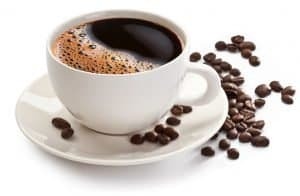 Some babies, particularly those under 6 months, may be more sensitive to mom’s caffeine intake. Better yet, moms may find beverages that are caffeine free or decaf. Some fishes are ideally avoided by lactating moms due to the risk of too high mercury levels. 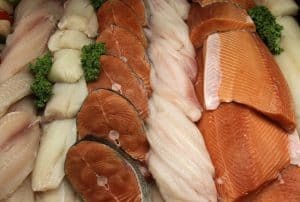 These fishes include shark, swordfish, mackerel, and albacore tuna. These are longer-lived, larger fish that feed on other fish and are thus more likely to accumulate higher levels of mercury. It is also recommended that consumption of fishes should not be more than 12 ounces a week. These allergens include dairy, peanuts, eggs and other seafood. Consult your doctor if there is a need to exclude these foods from your diet. 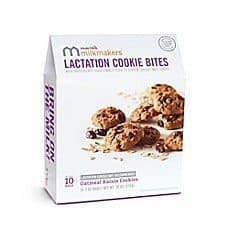 Each pack of Milkmakers lactation cookie bites is filled with tasty bite-sized cookies packed with ingredients traditionally used to support and improve breast milk supply. These cookie packs are very convenient, simply tuck one in your bag or munch on these while getting on your day. 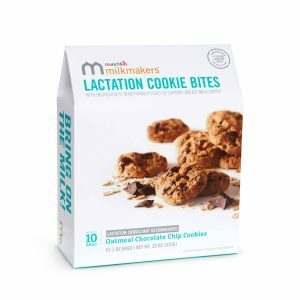 Milkmakers Lactation Cookies are seriously delicious, nutritious, and packed with key ingredients to help support mom’s milk supply. 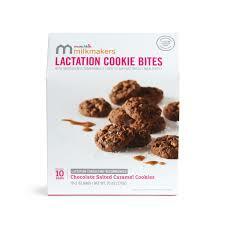 These cookies contain oats, brewer’s yeast and flax seed to boost mom’s breast milk supply. 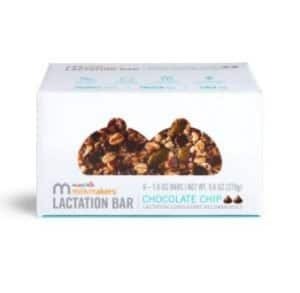 Similar to the cookie bites, Milkmakers lactation bars also contains oats and flax seeds with added almonds. Each of these chewy and yummy bars are filled with traditional ingredients used to support breast milk supply. Milkmakers Lactation Bars are seriously delicious, nutritious, and packed with key ingredients to help support mom’s milk supply. Many moms love that these lactation bars come in two different flavors. For those mothers who are on the fruity side, there are mixed berry flavored bars for you. And for those chocoholic moms, a chocolate chip bar is available too. 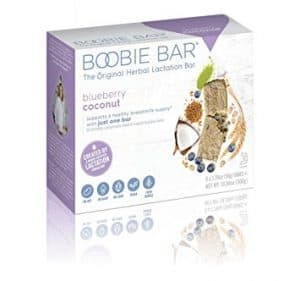 Most mothers really love that these herbal lactation bars are made with superfood ingredients. 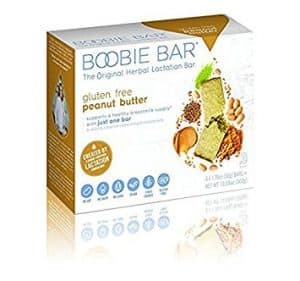 They include oats, flax seed, coconut oil and their boobie blend which includes moringa, turmeric, Shatavari, fenugreek, and spices. These bars are certified kosher, vegan, dairy- and nut-free, and non-GMO. Just one bar of these fantastic munchies is enough for a day. The Boobie Bar is created by a board-certified lactation consultant and neonatal registered nurse. At home or on the go, grab these soft-baked lactation bars to help support you on your breastfeeding journey. Made with wholesome organic oats, and fenugreek, this delicious lactation oat bar not only satisfies but also nourishes. It delivers an extra boost of nutrients to you and baby, including choline, ALA, and fiber. Mommy Knows Best is a known brand that really helps mothers during their breastfeeding journey. 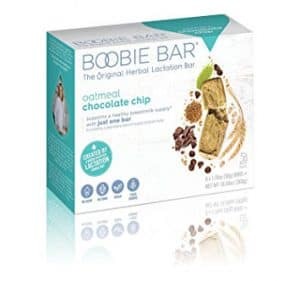 Their lactation boosting cookie is made with blessed thistle herb baked into each cookie to help boost breast milk quickly. These cookies contain the ideal ratio of blessed thistle herb, flaxseed, brewer’s yeast, and oats. All of which are essential for all lactating moms. With a healthy amount of chocolate chips baked into each delish cookies, you’ll find yourself reaching for this yummy guilt-free treat again and again. 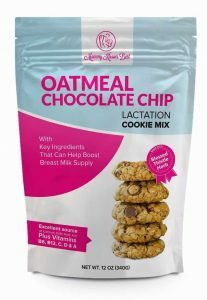 In addition to the milk-producing herbs and ingredients, these lactation cookies are packed with healthy amounts of calcium, folic acid, iron, plus vitamins B6, B12, C, D, and A. These chocolate almond coconut oatmeal bars are certified gluten-free, vegan with low sugar in each bar. They effectively promote milk supply since they are made with key ingredients. These include organic fenugreek, organic oats, organic flaxseeds, organic coconut, organic dates, dark chocolate chips, and almonds. 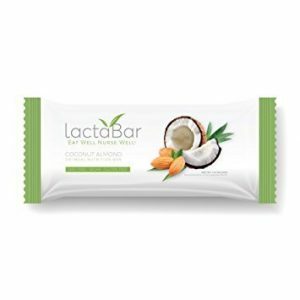 LactaBar oatmeal bars are developed and recommended by a nutritionist and certified lactation consultant. So, you are sure that what you are taking is really good for your breast milk supply and your baby as well. 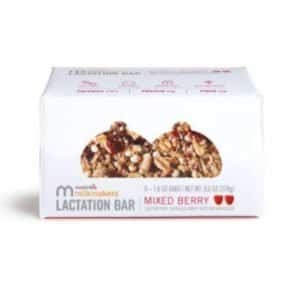 LactaBar recommends eating 1-2 oatmeal bars a day for effective promotion of breast milk supply. 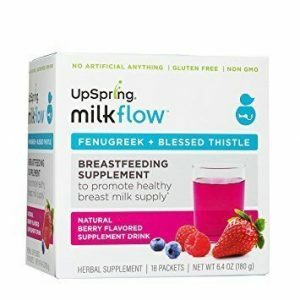 UpSpring Milkflow is a brand that offers different products for lactation support. It is always important to increase fluid intake when breastfeeding. 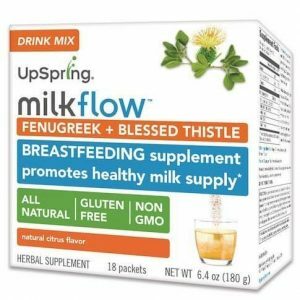 The formula of Milkflow Fenugreek + Blessed Thistle Drink Mix does not only include fenugreek in their formula but also blessed thistle and anise to help in improving milk production even more. 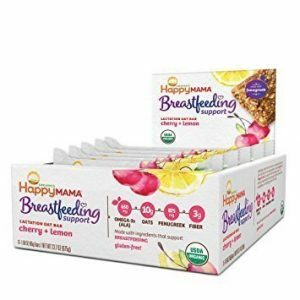 Moms really love that this does not come with a leafy and tea-like taste but in different tasty flavors which makes them enjoy this milk lactation supplement drink even more. 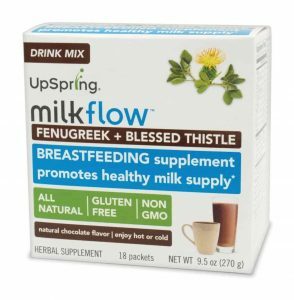 Just like the other Milkflow supplements, Milkflow Drink Mix can help if you’re trying to establish a sufficient breast milk supply for your baby to keep up with your baby’s demand especially when your baby needs more breast milk than you are currently producing. Never forget to drink enough water when you are breastfeeding. Staying hydrated is very important most especially when your baby’s demand for breast milk increases. When you are breastfeeding, you produce on average 750 to 850ml of milk a day. As a consequence, you have to increase the amount of water you drink daily. Not only do breastfeeding moms need the recommended amount of water for adults, but additional liquids are also required to make up for what your body uses in milk production. 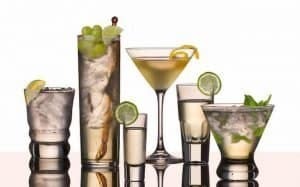 Good sources of fluids other than water include fruit and vegetable juices, milk and soups. Also, lactation teas and drink mixes are also of great help. There are also other lactation supplements that mothers can take to effectively boost milk supply.